Even less than that! Only twelve more training days to go! The last fortnight has been an up and down time. On one day I can tell a friend in the UK that I’m starting to feel strong and more confident. The next I can come crashing back down to Earth with fatigue after a dodgy night’s sleep. This update is inspired by the question of where my focus is and whether I’m race ready or not. I’ll admit I’m not as focussed for this race as I have been for some of my others. This isn’t the first time it’s come up and clearly my Tweets are giving that impression. Last time I mentioned it I put it down to the difficulties of motivation when I already have my Kona slot. That’s true, but it’s not the entire story. I want to race well in Taupo, I want to perform well. I would love to get myself on the podium again and that’s going to take a serious effort. I’m conflicted though. I’m enjoying training. I’m enjoying logging week after week of solid efforts. Right now I’m seeing progress in my swimming for the first time in a while. A consequence of motivation and consistency in training. I’m finally making progress on my running and feel that’s coming back to form. I’m making a reasonable effort of maintaining a high level of bike fitness since Epic Camp. All good stuff and I feel strong in each discipline when not too fatigued. If Taupo were a month down the line I think I’d be much more focussed on it! I spent some of this afternoon napping and the other half starting plans for my build up to Lanzarote. The race isn’t till May, but the goal of breaking 10 hours there and getting on the podium motivates me much more. Maybe it’s just the desire to make up for last year! So I’m not as focussed on Taupo as I could be. I want to race well there simply because I always want to race my best. I’m frustrated by the interruption to my training it will make. It’s been suggested that if I view Kona as my A race then this is simply a period of building base. It certainly feels that way. Like I’m getting myself to the point where I can really put in the work (I have some big plans for my running later this year). I worry Taupo might derail this, but maybe I need the break? Graphs, charts and numbers time. As usual graphs are from WKO+/Excel. 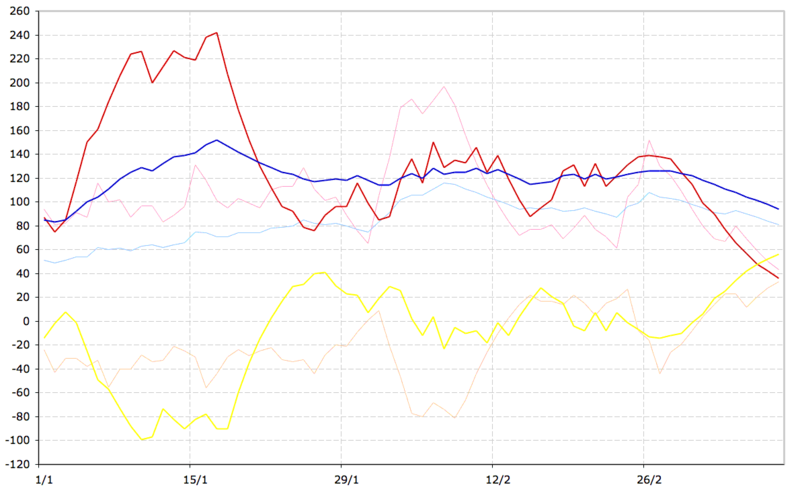 Red is ATL (fatigue), Blue CTL (fitness) and Yellow TSB (form). If you’ve read the blog before you must have encountered these by now! 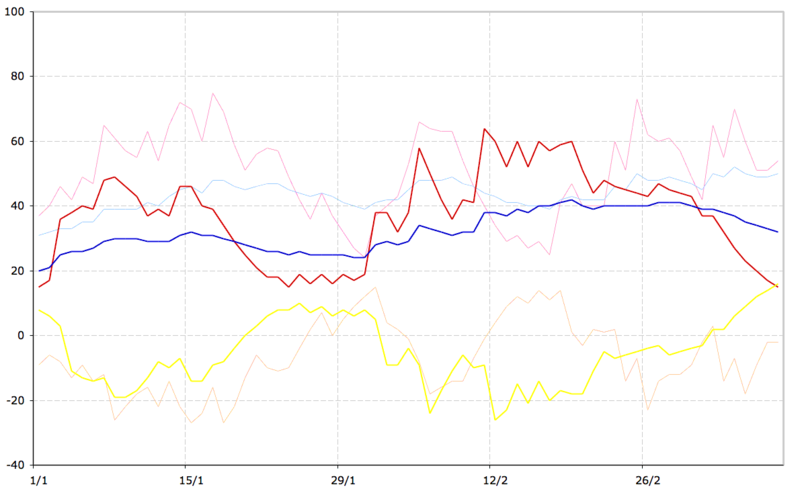 The lighter coloured lines are my values for the same time period in the previous year. Do bear in mind I raced Ironman Australia in 2009 which is a month later than Taupo. 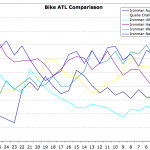 The bike performance management chart clearly shows my bike fitness is comfortably and consistently higher than this time last year. The big spike from Epic Camp was unsurprisingly unsustainable. So after a period of recovery I’ve focussed on maintaining fitness at an intermediate level. It’s taken a lot of riding to do this and a fair amount of hard work in the winds and hills round here. I considered growing the CTL more, but realised that to do this while trying to build up my swim and run would be very difficult. Part of the process since Epic has been accepting the limits of what I can do! Fitness is higher than post-Epic recovery, but no massive growth. There’s been more significant growth in my run fitness. I’m certainly feeling this and combined with the weight loss I’ve managed over the past few weeks I’m running well. Interestingly my fitness is lower than this time last year. I put that down to the huge bike focus I had during November/December and the lack of run focus after Kona. I think I’ve mentioned feeling my running really wasn’t in great shape before. The chart supports that as far as I’m concerned. I came into 2010 with my run CTL at the lowest it had been for a year. What I have achieved is restoring my run fitness to more reasonable levels. I’m easing back now with Taupo round the corner so there’s not much chance to build further. I’m aiming to put some solid build phases for the run into my Lanzarote build. Beyond that they’ll be a real run focus in the lead in to Kona. If I want to achieve my ultimate run goals I need to put a lot of work in between now and then. Charts aside am I race ready? Well fitness is there according to the Performance Management numbers. Comparing the run in to other races there’s enough similarity with my better races to give me some confidence. I’m continuing to train through the coming week and will take a short taper. Much as I’ve been having sleep trouble I’m going to save looking at the Performance Management tables and the details of my taper for another time! 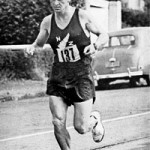 My feeling about Taupo other than uncertainty is that if I can get myself fresh enough then I’m in shape for a good race. The deciding factor is going to be the fatigue I carry into it. That said with this posted it’s time for a hot, milky drink and some natural sleep tablets (5-HTP). I have no idea if they’ll work or not. I’ll take the placebo effect if they’ll help me rest enough the coming fortnight!